IQeye Alliance-pro IP cameras are ideal for outdoor surveillance, coming with an IP66-rated weather-proof, vandal-resistant housing, and unlike the IQeye Alliance-mx IP series, offer a stand-alone IP CCTV solution. The range is available to buy now. We’ve recently added the IQeye Alliance-mx range of IP cameras to our IP camera store. This new series of IQeye IP cameras all come in an IP66-rated vandal-resistant housing, making them an ideal choice for both indoor and outdoor surveillance. Offering variants with standard and HD definition, these dome cameras are packed with features at a competitive price tag, which makes them a sound investment for any IP security system. All cameras in the Alliance-mx range deliver high quality images at up to 60fps and at up to HD1080p resolution, whilst IQinVision’s own technology, Lightgrabber, increases the camera’s sensitivity in low light conditions. Alongside this, the built-in infrared-cut filter allows the range to continue capturing usable footage even in complete darkness. The entire range also features two-way audio, ONVIF and PSIA compatibility and a seriously low power draw over PoE (<3.8 watts). Couple all this with the range's compatibility with most of the leading VMS offerings and you have an IP camera range that offers affordable reliability and performance. For further benefits and features take a look at our range of IQeye IP cameras, available to buy now. Alternatively call 0151 633 2111 and speak to one of our technical sales specialists directly. This is a short, simple guide explaining the emergency factory reset procedure for an IQeye 700-series IP camera. An emergency factory reset procedure is useful if you want to reset your camera back to its default settings or if you have forgotten the password. Network Webcams has recently added the IQeye Alliance Dome Range on its UK and European IP camera store. The range includes a series of indoor and outdoor dome cameras, all of which run Power over Ethernet. 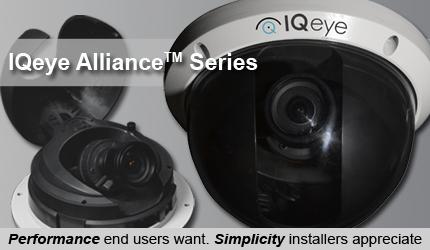 As with all IQeye cameras the IQ Alliance series offers a wide range of image resolutions, starting at 640×480, all the way up to 2560×1920 (5.0 megapixel) for both internal and external models. Prices start at £325 + vat for the IQeye IA10SI-B3 IP camera dome, Digital PTZ, 640×480 and PoE. 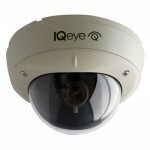 More IQeye cameras on Network Webcams’ UK and Europe IP Camera Store.